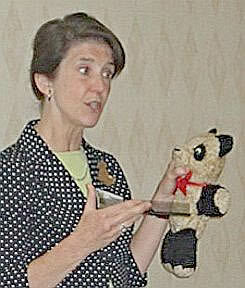 Brenda Yenke demonstrating various techniques for cleaning teddy bears and vintage stuffed toys. White Terry wash cloths. Some with nap but thin enough to handle. Ivory Snow, Woolite or Oxy Clean granules. Depending on the fabric to be cleaned. Can you imagine not washing your hair for 30, 40, 50 years or longer? Well, our dear antique and vintage bears and their furry friends, are often found in that exact situation. They will have a longer life if you clean them gently and then place them in a protected from environmental pollution and away from extreme heat and sun. Protect them too from moths with Enoz Lavender Scented Moth Packets. To begin, you must determine the type of fabric. Mohair cleans very will with Ivory Snow or even just plain hot water. Silk Plush is the most difficult. The vintage plush requires Woolite Aerosol Upholstery Cleaner or Oxy clean granules. Do not spray the cleaner onto the bear, instead spray the cleaner on an old but clean white terry wash cloth. If your treasure is airbrushed, be very careful as this is not colorfast! Do very little cleaning for the air brushed area using gentle and quick strokes. It's a good idea to keep airbrushed enhanced bears out of the sunlight since the air brushing fades over time. Velvet is very fragile and very vulnerable. It is almost a dry cleaning method with light strokes and Woolite Aerosol. Make certain the fabric you are cleaning is strong as any dry rot would devastate the area being cleaned. Even the most accomplished professional will not tackle that job. Often I suggest that it is best to enjoy the item "as is" and keep it in a quiet secluded area. Any tags that are affixed to the bear need to be protected as you clean. Cloth tags should always be cleaned around and never touch the tag's fabric with your cleaner. Paper tags can be sealed with saran wrap and held in place with tape. The paper tags on Steiff (chest tags) are handled with saran wrap. War Zone cloth tags, sewn into the seems, should always be respected. Do not wash or get them wet! When working around tags I suggest using a Q-tip or tooth brush. Any artist's signatures should remain untouched as well.